Oh my sweet jeebus, I just DIED INSIDE thanks to this unbearable cuteness. 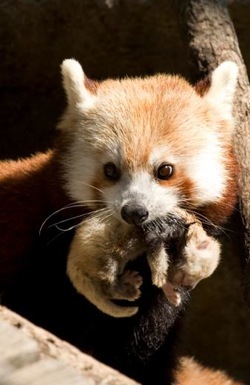 Mama Red Panda Shama is here with her week old cub, who is nameless, and totally adorable. The Red Panda exhibit at the zoo is off-limits for a while as Shama and the cub need privacy to bond but you can bet money that this Fall there will be massive lines to gawk at the adorableness that just burned out my eyes. Oh, I want one I want one!!! !